Always Drunk: Huffington Post Sold To...AOL? Really? Are They Still Around? 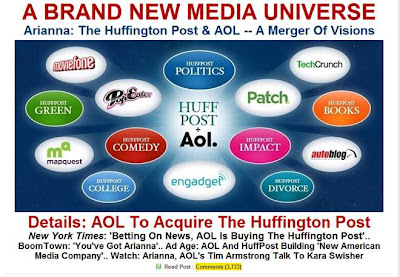 Huffington Post Sold To...AOL? Really? Are They Still Around? So AOL is buying The Huffington Post for $315 million. Dudes: You could have had me for so much less. In economic terms, $315 million is a crapload of money (assuming you're talking to the right sort of economists). And the deal includes Arianna Huffington herself, so it's not as if AOL is paying mostly to buy out A-Huff and getting some cubicles and a bunch of Dell workstations thrown in. Herself is staying on as an "editorial czarina" for her new media overlords. If I were she, I'd demand a bunch of business cards printed up with that title, first thing. I'd be dropping those babies in the fishbowl at every Boston Market in town. Yo, the Editorial Czarina wants lunch for six, and don't be skimpin' on the sweet-potato casserole. And don't spell the name wrong when you write it on the Weekly Winner sign by the front door. That's brand visibility right there. But back to the money. In case you've forgotten, it's $315 million. That's more than the gross national product of 23 countries. Granted, most of them are countries like Tonga, and Saint Pierre and Miquelon (which I actually thought was the starting defensive line for the Montreal Canadiens, so I learned something today). It's still a wad of cash. In fact, it's about fifty cents for every one of those damn CDs AOL mailed out in the 1990s. I'm not sure The Huffington Post should be the recipient, but it's nice to know that in a way, America Online is essentially paying reparations for littering our planet with those things. It's interesting to note that the money Ms. Huffington and her little website got out of this deal is 453 times more than I requested from Oprah last year. I never heard from O, by the way, and I think now I understand why. When I asked for $695,000, I earmarked the money for things like funding public television and helping my sister's kids go to college. I admit, I was hoping to appeal to Oprah's sense of altruisim and philanthrophy. I never offered her any product or service in return. Lesson learned: never bring an empty gravy boat to Oprah's table. Our top story: AOL is peachy-keen! ﻿﻿I'm not sure how well that image will load on a dial-up connection. Anyway, good luck to HuffPost and AOL. ﻿﻿Ms. Winfrey, just have your people leave a comment below this post and we'll talk. And Tonga, you're going to have to raise your game to compete in the global marketplace with today's hottest gossip and unpaid political commentators. Just saying.